Melt your Margarine over a medium heat and then remove from heat. Whisk in Brown Sugar, Sugar, Cocoa, Banana, Applesauce, Egg Replacer and Vanilla until completely blended and smooth. Then using a hand held electric mixer, blend in Flour. Spray your glass pie dish with a light coating of Baking Spray and then pour your batter into the dish. Now Use a spatula to smooth the batter into an even layer. Bake for 20 minutes or until you can stick a bamboo skewer into the center of the cake and pull it out cleanly. 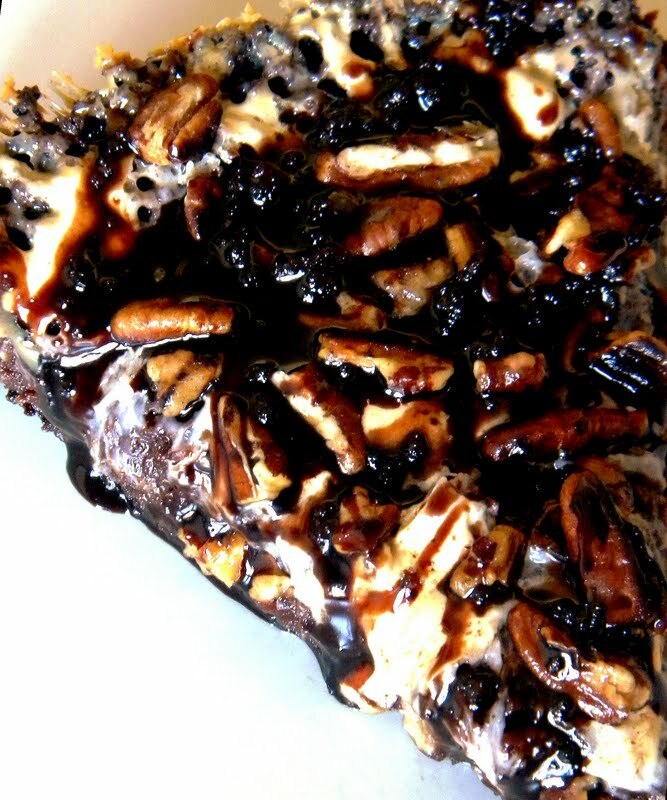 Then remove your cake from the oven and pour your Marshmallows and Pecans over the top. Spread them out to make an even layer. Bake for 5 minutes or until the Marshmallows are a little bit golden brown and melted. While you are baking your cake, make your Chocolate Sauce. In a saucepan, heat Agave Nectar and baking Chocolate over a low heat, stirring frequently until the Chocolate is melted. Then remove from heat. Stir in Margarine and Vanilla. After you remove your cake from the oven, drizzle with Chocolate Sauce while the cake is still warm and let cool. You want to serve the cake while it is still warm and chewy... and with a big glass of happy. Love your blog. Even though I don't eat gluten, sugar, or any of the cool stuff you make now!! But it's so awesome that you are making "normal" food totally veganized!! You can be a 1950's housewife and not serve dead cows. LOL - "glutton" free! Please don't post any glutton free recipes. It may be a sin but vegan gluttons must have earned some brownie points to cash in when it comes making recipes from your blog. By the by, I totally want to be like Happy Wolverine. So much so I'll choose to remain ignorant of any bad things people may be saying about him. 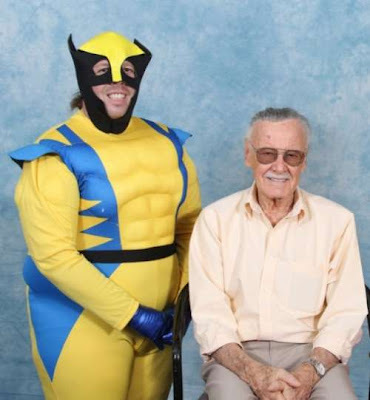 Besides they're just jealous that he got his picture taken with Stan Lee.